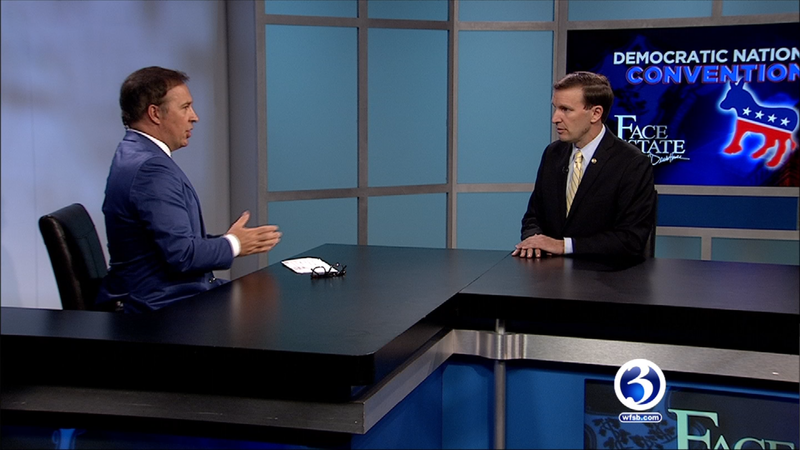 Senator Chris Murphy has seen his stock rising in the Democratic party. One of the youngest members of the senate, Murphy made a national name for himself during a filibuster calling for a vote on gun control. The Clinton campaign noticed, and he was invited to address the Democratic National Convention. 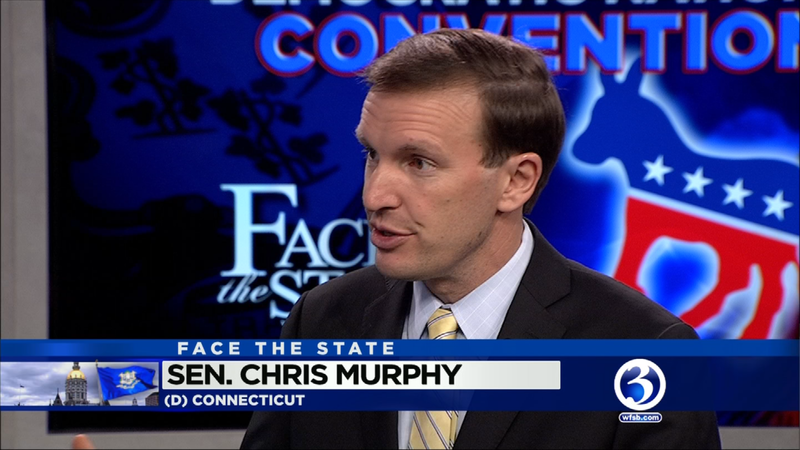 On Sunday’s Face the State seen on WFSB, I asked Murphy about his big speech, and about a suggestion from a columnist he be considered as Clinton’s running mate. I also asked him if he would join a Clinton cabinet, if she is elected, and he is approached by the new president to be a part of her team. He also said his senate colleague Richard Blumenthal would be a great choice for Attorney General in a Clinton administration. Murphy and I also talked extensively about Hillary Clinton versus Donald Trump. As a Clinton surrogate, Murphy will have to deal with a chunk of the electorate who does not trust his candidate. I asked the senator why he trusts her. Murphy did not hold back when it came to Donald Trump, saying he feared a Trump presidency. Murphy said if Trump is elected, Putin could expand into Eastern Europe by force, and it could encourage Isis to carry out attacks in the U.S. But Murphy said he could work with a President Trump. 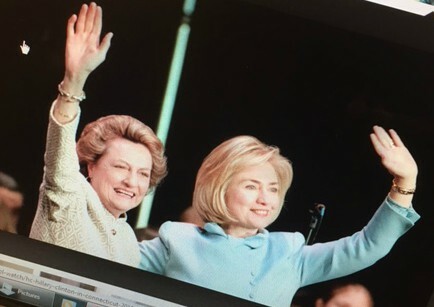 Our flashback takes us back to the spring of 1998, at the height of the White House intern scandal involving her husband, when Clinton came to Connecticut to campaign for gubernatorial candidate Barbara Kennelly. I also want to take a moment to thank an incredible young woman for her help this summer. 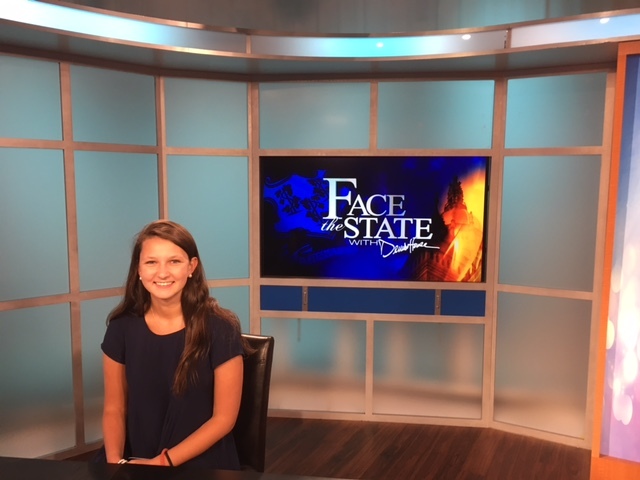 Grace Dubay worked as our Face the State intern, and helped with research, the guests and questions. We wish Grace the very best as she finishes high school and starts to look at colleges. Who knows, maybe someday she’ll be sitting in my chair. “I think he’ll get people killed. I really do.” Murphy stated. Well we know Hillary already got people killed. And Republicans are accused of fear- mongering?? Hillary has already gotten people killed and who knows what danger undercover operatives whose cover has been blown by her foolish email abuse are in because of her actions? One trick pony playing to sycophantic democrat crowd. Nobody can fear monger better than that angry empty suit, Chris Murphy. 70% of the American people think the country’s heading in the wrong direction. Murphy’s liberal agenda of political correctness has been the most diabolical incarnation. Blacks are dying in record numbers in the cities controlled by Democrats for generations. The education system reeks of incompetence and negligence. There’s only one way to make the BIG change that people crave. We must fracture the chains that the establishment has forged into our inhuman conformity. The status quo is NOT an option. It’s time to set the American economy free from low expectations and allow Yankee ingenuity to run free for the goal line. Small-minded men like Murphy are like the Zika virus mosquitoes. They buzz around pestering us until they bite and draw blood. I am NOT an Trump supporter. I was a Republican who changed party affiliation to Democratic to vote for Senator Senders in the Connecticut primary. Like many former Republicans, Independents and yes, long-time Democrats I believe that Senator Sanders offered the best vision for the future. However, that is not going to happen now. So now we are left with two unacceptable choices. What’s that you say? Clinton is far superior to Trump; her curriculum vitae she is the most qualified person to ever run for the presidency. Well let’s look at that. Clinton’s tenure as Secretary of State has been the continued pursuit of regime change in one disastrous misadventure after another. Yes, it started with the Bush administration’s regime change strategy in Iraq, but it has continued unabated in the Obama administration. Clinton has continued to push toward Russia’s borders. What are the Russians supposed to make of this? It seems that Clinton has picked a team of neo-cons like Victoria Nuland (spouse of Robert Kagan), and Samantha Power to deploy US diplomacy abroad. The United States is pursuing a high-stakes game of brinksmanship with Russia. Maybe Clinton and her cabal of neo-cons believe politicians within Russia who are sympathetic to the West will oust Putin, and the Russian people “will welcome us as liberators”. Where have we heard that bill of goods before? It’s a matter of life and death, alright. And Senator Murphy thinks the same people that brought us Iraq, Libya, Syria, and Ukraine are not the dangerous ones? Murphy is the epitome of a non-respected stuffed suit. And annoying. Like Clinton, he tries to believe his own lies.